GameStop Calls DLC Trade-Ins "Possible"
GameStop might someday, somehow allow its customers to trade-in downloadable content. In what is likely an effort to avoid becoming the next Blockbuster, GameStop has been paying close attention to the new wave of videogame digital distribution. By selling DLC in stores and purchasing digital portals like Kongregate, GameStop is making a strong attempt to participate in digital sales which some major publishers think will overtake retail sales as early as 2011. According to Shawn Freeman, senior VP and GM of GameStop's digital business, it may also try to incorporate digital sales into its bread-and-butter used trade-in business. In an interview with IGN, Freeman talked about how GameStop has been building digital customer loyalty by offering exclusive DLC and even selling DLC cards in stores for items like the Halo: Reach Noble map pack. He says these initiatives will only expand further in the future. GameStop makes most of its dough from used sales, so what happens when everything goes digital and physical trade-ins start to dissipate? They might not, Freeman says. Freeman calls digital trade-ins "totally possible," but says they "may not be as popular as physical sales." He didn't go into detail on how trade-ins of digital goods would actually work. In all fairness, this may have been a passing comment, almost like saying: "Anything's possible." Though the idea has come up before, the very idea of trading in digital goods doesn't seem to make much sense. It's already a very real practice at digital retailer Green Man Gaming, though Green Man basically allows you to use the games you've bought as a way to discount future games and doesn't actually sell "used" digital content. This is something very good for the customer, but I fail to see how it would replace a physical trade-in business like that in place at GameStop. 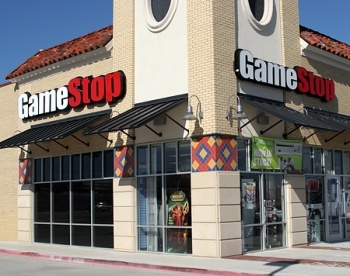 In actuality, GameStop will probably just transfer its brick-and-mortar business to the digital realm, creating its own storefront similar to Steam but with the advantage of mainstream brand recognition. Freeman says GameStop would "love to be like the next Netflix for games." It might just have to abandon the idea of trade-ins, as hard as that may be with all the money used games generate.